I first found Peter's illustrations a few years ago and was immediately pulled in by the bright colors, geometric shapes as well as Memphis and Postmodern references. His work, on one hand, minimalistic in approach and very complicated in composition, spurred a certain nostalgia for early 1990's Nintendo video games and my childhood playing The Sims. I personally would love if Peter came out with his own postmodern version of the game so we could enter his bold worlds and spend a day in those interiors. Put it on your future projects list Peter! After chatting here and there over the course of the past year we finally got ahold of the busy London based illustrator to have a coffee and chat illustration. We discuss expressing ourselves with emojis, learning to translate and learn the skills to turn illustrations into actual furniture, how to juggle a full time job while starting your own studio and the biggest challenges that come with having your own studio. Grab a coffee or a cup of tea and join us in Peter’s studio! | Kristen | Hey Peter, could you please introduce yourself and what you do? | Peter | Should I do entirely with emojis? Only joking alright serious hat on. | Kristen | Yeah why not. Ok random side note when I first started dating my now French ex I used to answer him all in random emojis just to see his reaction. He didn’t understand at all that I was being silly and he would try really hard to send me serious replies to like - a line of octopus, gems, monkey faces etc in his best English. Anyways I love emojis. | Peter | ha I’m still strugglng to get fluent in emojis pretty funny when people reply like that doesn’t make sense and it’s a picture of a dancing girl and beers. | Kristen | I think emoji is the next world language. Ok - back to business! Please introduce yourself. 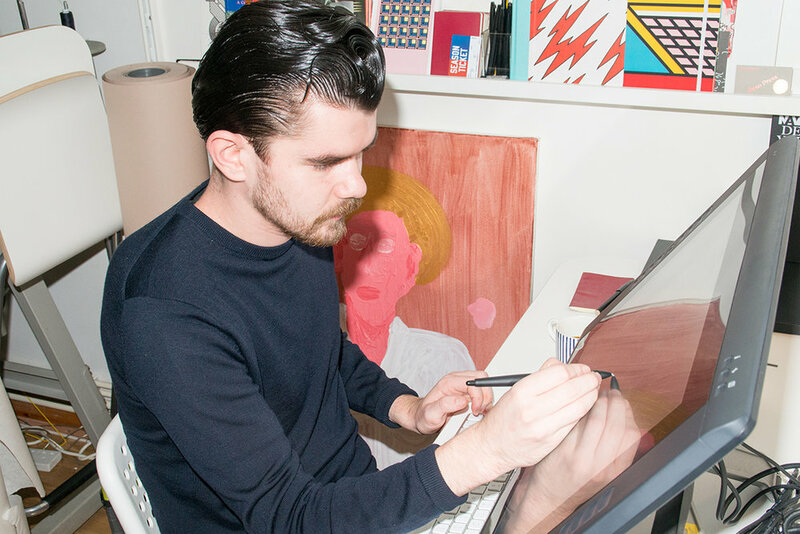 | Peter | I’m an Illustrator and designer born and bred in London. My work has a large focus on abstracting a reducing aspects of the world around us toying with the idea of balance and concept. | Kristen | What is a typical work day for you? | Peter | Most of my days are spent in the studio juggling projects, a lot of e-mails, feedback, waiting for feedback, sketching and pacing. But I do get the odd project where I get to go out and work in other studios and very occasionally get to get hands on with the physical making of work which is definitely something I want to work into my practice more. | Kristen | Wow great. What types of projects do you work on aside from traditional illustration projects? | Peter | Last year I worked with Kingston University and designed and built a piece of furniture out of powder coated steel. It’s definitely up their with my favourite projects as I was in charge of the whole process so got to learn all of these new skills like plasma cutting, angle griding, bending steel sheets and powder coating alongside helping the team pave the rest of the garden which felt like one of those very useful future dad skills. | Kristen | So interesting! That was your first experience with making furniture? So they helped to teach you how to use all of those tools? | Kristen | I bet our dads could really build so many things. I don’t really have any male friends actually that have many future dad skills, yet my father can more or less do anything handle, build anything. How did they learn? Then again I have no future mom skills. Cooking and patience are not my forte. I think or generation somehow missed something there. | Peter | Yeah I’d never made anything close to the scale especially not with such industrial materials and the technicians in the workshop were great, I already knew most of them as I worked in the printmaking studio as a technician for a year before. So they didn’t get too angry with my constant pestering and loitering. | Kristen | How did you get interested in illustration and design and how did you decide to pursue it as a career? | Peter | I think like all children I’ve always drawn. I think the only difference Is I carried on! There’s a nice quote from Henry Moore, not directly related, but when asked why he was the most famous of his contemporaries he said “I’m the only one that carried on.” I think it was less to do with thoughtfully pursuing it. I really wanted to be a drummer before art took over. | Kristen | What were some of your previous jobs? Did you have any odd jobs that influenced you in one way or another? | Peter | The only job that’s really influenced me is working for a year as a print making technician the year after graduation. My use of line came out of the process of screen printing, basically the thicker the black lines the less likely you where to have issues with registration. I’ve stuck to it and even though I have less time to print my work still has a large focus on how you can represent objects and moods with quite brutal line work. | Kristen | Thats a really interesting insight into your work. | Kristen | How did you decide to branch out and start your own business or studio? It must be hard in such an expensive city as London. | Peter | The print technician job was only two days a week and just about covered rent and the occasional pint so I spent the rest of my time trying to build up a solid body of work and sending e-mail after e-mail trying to get freelance work. After a year the jobs started to come in and with the obvious ups and downs but I can’t imagine myself doing anything else so even with renting in London the pain feels worth it. | Kristen | Its always worth it when you find what you truly love. I’ve lived on barebones income at times to pursue what I loved. Nothing can compare to the feeling when you can’t wait to jump out of bed to get to work. | Kristen | Was it difficult to find your first clients? How did you go about reaching out to people and finding jobs? | Peter | I didn’t really look for clients I focused mainly on personal projects. Things that interested me but that didn’t have any commercial application and the majority of my e-mails went out to magazines and blogs… with the intention that the clients would come to me luckily some of the magazines gave me little editorial jobs and other clients saw the posts and it all kicked off from there. I’ve also got an agent now which takes a little more stress out of the equation! | Kristen | Great that you could stay true to yourself and let them find you for that. Build it and they will come! | Peter | ha feels a little arrogant looking back on it! | Kristen | Not at all, I think it is an important thing for young creatives to do to ensure they do not get stuck doing creative work they don’t believe in or that doesn’t reflect their creative integrity. | Kristen | What was your first big project or big ‘break’ that got you exposure? 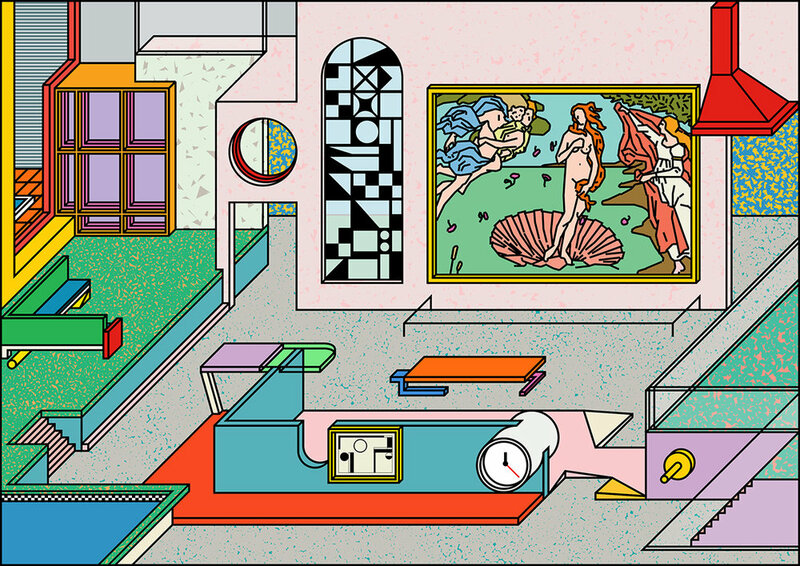 | Peter | I did a series of interiors and buildings under the title “Town Planning”, heavily influenced by Ettore Sottsass and the whole Memphis Group and 70/80’s Anti Design movements which got a load of press. It was around the same time the V&A did an exhibition on Postmodernism which then became a massive trend in the design world. I was just lucky enough to be in the right place at the right time. | Kristen | Do you have an agent, how did you go about finding them and or them finding you? | Peter | I do have an agent and they found me! Short and snappy. | Kristen | Do you find social media helpful in exposure for your work? Did you ever get contacted for a project because of something you posted on social media? | Peter | I think you have to let people know that you exist and social media is a very good way of doing that. Alongside letting people know that you’re busy, which is attractive to clients, I’ve had a few jobs where the clients told me they follow my Instagram or they’ve seen my work on someone else’s. So It does happen but I don’t normally find out how they discovered me. | Kristen | I think a lot of people just starting off are really intimidated about networking, how to go about doing that etc. I think it also depends on the city, where as I think in Paris for instance, it is so essential to network or you won’t get far... Whereas in other cities I’ve lived in, I found it was more important to just put your work out there. | Kristen | How do you feel about networking? | Peter | I’ve never felt comfortable networking, It can feel quite manipulative or disingenuous because everyones trying to push their own agenda. But now and then I’ve had some really interesting chats with people and projects can come from that initial chemistry you have with someone else creative so don’t get me wrong it’s not always a negative experience. I think the older I get the less socially inept I’m getting so maybe in a few years I’ll be saying how much I love it! | Kristen | I know it feels bizarre at the beginning to be honest but I think once you’re in a likeminded circle it feels less like PR and traditional networking and more sharing similar interests and meeting people who could potentially work well with you on future endeavours. | Kristen | Its something I’m personally terrible at! I love meeting people but seem to always get everyone else jobs rather than networking for myself. | Peter | Yeah I think it’s all about networking with the right people instead of when you’re fresh out of uni you’re just told to bombard everyone; not ideal! | Kristen | Yeah it takes time to find the right circles. "I think the biggest challenge about having your own studio is staying positive. 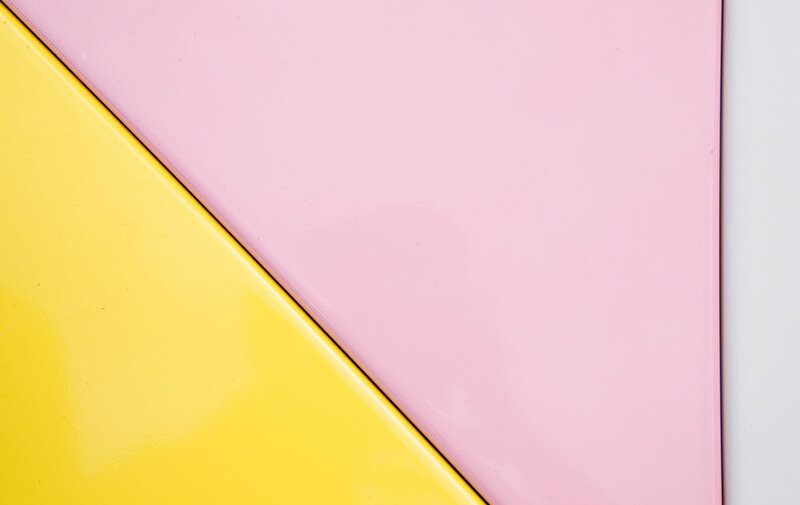 Freelancing is so inconsistence so if you go through a drought it’s really easy to start doubting yourself and questioning if you’re on the right path." | Kristen | What is the biggest challenge about having your own studio? | Peter | I think the biggest challenge about having your own studio is staying positive. Freelancing is so inconsistence so if you go through a drought it’s really easy to start doubting yourself and questioning if you’re on the right path. I’ve always thought of it like a football team where you’ve got to be the players and the manager and the managers job is to build up the players if they’re having a rough spell and also keep their ego in check if they’re doing well! It’s something I’m still getting my head around but the pros definitely outweigh the cons. | Kristen | Great advice, I need to remember that one! | Kristen | Was there one surprising thing you learned along the way? | Peter | That I could actually make a living out of it, touch wood! | Kristen | Do you have a particular source of inspiration the drives your work? | Peter | I think the longer I’ve been working there are a few dominant themes that I’ve kept revisiting. I’ve always had a massive focus on architecture, furniture, objects basically the things we interact with on a daily basis and the fundamental aspects that span from them like space, form and balance and colour. But aside from these themes I’m a massive fan of fine art, philosophy and a bit of phycology, so there’s not something specific I’m always looking into but I always seem to come full circle and end up looking at the same thing from a different angle. | Kristen | Whats you’re favourite project you’ve worked on and why? | Peter | I’d have to say the furniture project at Kingston University, for the reasons I gave above. But I’m currently working on a few projects where I’ve really been able to up the scale in which I work with a 70 metre long hoarding for a new hotel and another recent mural job where I’ve designed ten murals some up to 15m long. It’s really exciting taking things off the screen and having them realised on what can be quite an intimidating scale. | Kristen | Can you describe your creative process? You often do these colourful, geometric, architectural, minimalistic yet complicated scenes. Was there something that first inspired this and what does your creative process look like when you start a new project? | Peter | I don’t really have a specific way of working. I carry around a notebook and write down loads of little ideas and thoughts but don’t really sketch. Most of the creative stuff is done on screen. I’ve found loads of people in the creative industry (especially illustration) turn up their noses at computers but Wim Crowel said roughly off the top of my head that you can’t make better design on a computer but a computer can speed up the designing process. And I’m fully in that way of thinking. I don’t think a computers better but it’s a great place to try things out quickly and get your head around a concept before experimenting with the best way to produce it. | Kristen | What is the DNA of London? | Kristen | Sounds like New York! | Kristen | Thank you so much for taking the time to talk to us today. We’ve followed and loved your work for a long time and look forward to seeing what you do next! Best place to get a drink in London? Any pub with seats. Not a fan of standing. Hotel you would stay in if you weren’t from London? This great Japanese fashion boutique called Unique Clothing. Illustrator Jack Taylor and Photographer Alexander Coggin! Best place to take clients in London? Resources to help you with your career?